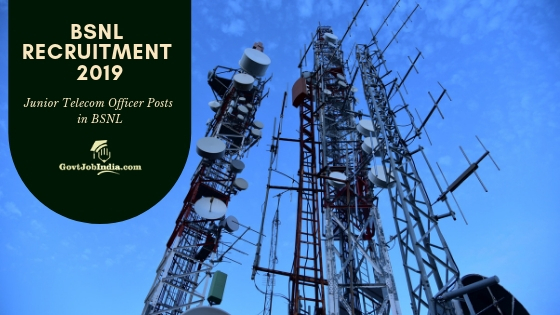 BSNL Junior Telecom Officer Recruitment 2019: BSNL, one of India’s leading telecom providers, has launched the BSNL Recruitment 2019. BSNL aims to recruit capable candidates into the post of Junior Telecom Officer. All interested candidates are requested to apply online for this recruitment by submitting their BSNL JTO Online Application Form @ bsnl.co.in. The Online Application form is available on the website of the BSNL. We have provided a link below which you can use to fill your online application form. This is an amazing opportunity for all the candidate who is seeking a govt job in India. The BSNL is presently recruiting 198 candidates for this post. Since this is an all India Recruitment, applicants are expected from all parts of the country. All the details regarding the BSNL Junior Telecom Officer recruitment including information about the JTO salary, application fees, and eligibility criteria have been provided here. Make sure to go through this article once before you apply online for this recruitment. Selection Process Selection will be made through GATE Score. How To Apply Online For BSNL Recruitment 2019 @ www.bsnl.co.in ? Candidates who are interested in this opportunity provided by the BSNL are required to send their Online Application from the website of BSNL. You can use the link provided here to apply online. Follow the instructions provided below to Apply Online for the BSNL JTO Recruitment 2019. All the details you need regarding the BSNL Junior Telecom Officer Recruitment is available right here. Consequently, you can also check out the official website of BSNL for more details regarding the JTO Recruitment 2019. If you have any doubts regarding the application process then makes sure to address them in the comment section below. Our team will help you out in any way we can.